A trailer, promo, and photo from the upcoming Disney XD series Avengers Assemble will surely get fans of last year's blockbuster Marvel's The Avengers interested in this animated program. The series runs parallel to the movie, bringing this group of superheroes back together, along with a new addition in Falcon. The series will air a special one-hour preview on Sunday, May 26 at 11 AM ET, with the official debut slated for Sunday, July 7 at 11 AM ET, as part of the network's Marvel Universe block of programming. 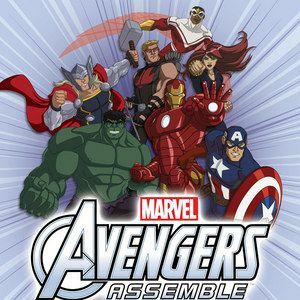 An animated series parallel to the record-breaking blockbuster movie Marvel's The Avengers, Avengers Assemble sees Iron Man leading the team of mightiest heroes - Hulk, Captain America, Thor, Hawkeye, Black Widow and newcomer Falcon - who combine their powers to battle threats no single hero could overcome. When the Avengers assemble, evil doesn't stand a chance. The voice cast includes: Adrian Pasdar (Heroes) as Iron Man, Fred Tatasciore (Kung Fu Panda: Legends of Awesomeness) reprising his role as Hulk, Roger Craig Smith (Wreck-It Ralph) as Captain America, Travis Willingham (Shelf Life) as Thor, Troy Baker (Ultimate Spider-Man) as Hawkeye, Laura Bailey (The Super Hero Squad Show) as Black Widow and Bumper Robinson (The Game) as Falcon. Joe Casey, Joe Kelly, Duncan Rouleau and Steven T. Seagle of Man of Action Studios (Ben 10, Generator Rex) will serve as executive producers.